"When the Rams moved from Cleveland in 1946, they were one of the best teams in the NFL, and in 1951 they brought Los Angeles an NFL title. When they left Los Angeles in 1980 to move down the freeway to Orange County's Anaheim Stadium, they once again were one of the league's best, having won seven consecutive division titles and having just appeared in a Super Bowl. But Anaheim Stadium had been no kinder to the Rams than to its original tenant, baseball's California Angels. The Angels have never gone to the World Series and the Rams, since moving from the Coliseum, never went to the Super Bowl or ever close. Attendance and interest dwindled, Rams owner Georgia Frontiere moved the franchise to St. Louis in 1995. Don't worry about too much advance planning - this is one of the easiest tickets in professional sports. As the saying goes, good seats are available. Well, decent seats, anyway. No one is going to accuse Anaheim Stadium of hosting the quintessential football experience. The seats were designed for viewing baseball. The folks at Anaheim do a nice job converting the facility for football, but it just isn't the same as viewing a game at a real football stadium. The crowd's constant booing of the home players, plus angry banners such as "Please, Georgia, Sell The Team." don't add to the ambience. However sad the play, remember you're just a few blocks away from Disneyland, the happiest place on earth. Most people can't afford NFL football and Disneyland on the same day, but it's worth a thought." Home of the Los Angeles Rams for 15 years, Anaheim Stadium continues to serve as the home of the Anaheim Angels. Long before moving to Anaheim Stadium, the California Angels (MLB) had been playing at the stadium since 1966. After founding the Los Angeles Angels (MLB) in 1960, owner Gene Autry decided to build a new stadium for his team. Modeled after Dodger Stadium in Los Angeles, Anaheim Stadium opened on on April 19, 1966. The three tier stadium had 43,250 seats, which stretched from the right field foul pole to home plate, and around to the left field foul pole. Escalators, elevators, and ramps helped fans get to their multi-colored seats. Anaheim Stadium instantly became known as the "Big A", because of the A-frame scoreboard that was behind the outfield wall. It was 230 feet tall, and a $1 million giant halo topped the scoreboard. 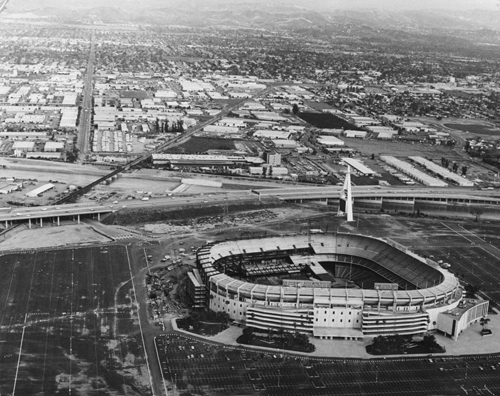 After playing at the Los Angeles Coliseum for more than 30 years, the Rams announced in mid 1970's that they would move toAnaheim. 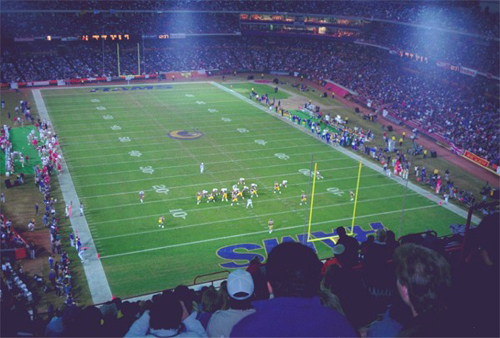 In order to accommodate the Rams, Anaheim Stadium was enclosed increasing the seating capacity to 65,158. Three tiers of seating now enclosed the field. A new scoreboard was installed on the facade of the outfield roof, because the "Big A" was moved to the parking lot. New executive and media boxes, along with a new sound system were also added. The process to convert the stadium from baseball to football was relatively simple. A section of seats were pulled from behind what was the right field was during a baseball game. The Angels and Rams shared Anaheim Stadium for 15 years. After attendance at Rams games dropped, owner Georgia Frontiere moved the team to St. Louis after the 1994 season. With the Rams departure and earthquake damage, many changes took place at Anaheim Stadium. After the 1996 season, renovations began with the removal of all the outfield seats. Replacing the 20,000 plus seats in the outfield are bleacher seats, a video display board, an out of town scoreboard below the right field seats, a "California spectacular" in which geysers erupt and a stream cascades down a mountainside covered with real trees and artificial rocks behind the left-center field fence, and new bullpens. All of the multicolored seats were replaced by green seats. Renovations also took place to the exterior of the stadium. The concrete structure and ramps were painted green. A plaza was constructed outside the stadium with two giant Angel hats. Anaheim Stadium was renamed Edison International Field in 1997. With a new capacity of 45,050, the renovated stadium opened on April 1, 1998.